CLICK ME FOR MORE ! 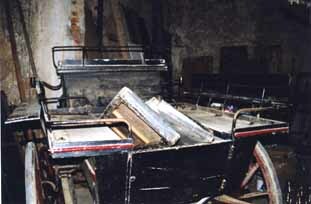 It is important that you start by cleaning the old carriage from dust, mud, oil etc. 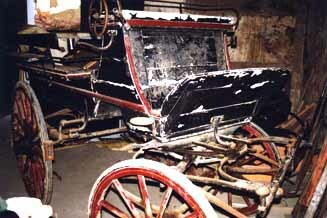 The objective isn't cleaning but to force you to pay attention to all the parts of the carriage - This is the best way to get to know the carriage and it's condition. Some Photos of the original condition (not only general but also of small details) can sometimes help you when you have some doubts about how to finish your work - remember that you'll be finishing the carriage some months after and sometimes you can not remember all details. If you've never done this before, then the first rule is to have a small book where you write piece by piece everything that you disassemble (For assembling again you just fallow the opposite order). If you're not going to do the upholstery yourself then it is better to take exact measures and drawings if it so that you can at the end demand for a precise work to the person that does it. When taking out the old upholstery, care about removing all old nails and the horse hair in the interior (if the is any) in one piece - so it can be used again. If there is a screw that it is harder to unscrew just us penetrating oil or heat it with fire (that usually helps) - don't worry, the wood won't burn if you're fast enough.... After disassembling all the top part of the carriage suspend the main chassis so that you can remove the main iron parts - Be careful when you do this: don't forget that 80% of the weight of the carriage is usually there and that accidents do happened).... At the end all the iron parts including suspension leaves shall be disassembled (mark them all!!!!). There are thousands of techniques for doing this job. If rust is too much you can send the iron to someone that removes old ink and rust with sand rain (it is not expensive and will give you excellent duration of the work). If you want to do it yourself then it is better to use chemical products with the ink over iron and fire with ink over wood. It is quite simple and after a few hours doing this job you'll be a master yourself. If it iron you must polish the surface and give a first coat of a chemical rust stabilizer (don't forget that iron is a chemical unstable material) immediately after you've removed the old ink and rust. If it is wood it is not so important to treat it immediately but still if you polish it and give it a first base coat of ink you'll keep up with a good rhythm of work (both iron and wood will be at the same stage). Note: of course you only give a coat of ink to the parts that don't need to be repaired. Old wood and damaged iron must be restored. If possible try always to make new pieces if you don't trust the resistance of the old ones. 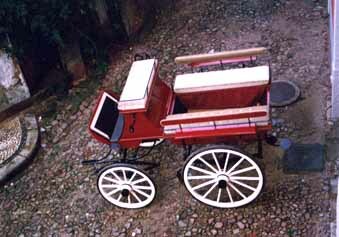 Don't forget that in a carriage everything works as a set. All pieces support dynamic forces during driving, so, there can be no weak points. Fallow always this procedure and don't be afraid to substitute everything that needs to be replaced - You'll thank yourself for that in the future. Repeat the final procedure of the Third step and give a ink protection to the repaired/new parts. 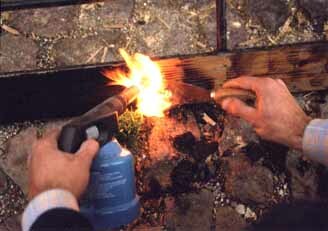 All sets of wood/iron or iron/iron that are going to be firmly tight together must be assembled at this point (fifth well wood and iron parts and spring iron leaves) - Use fire assembling techniques or some printable silicone material to guarantee that the wood/iron sets are perfectly joined. Some people put oil between the spring leaves so the suspension will work better but I don't advise you to do that because this will create some difficulties with the final ink coats. C - 1 coat of color final ink - used very thin water sandpaper to prepare for next coat. 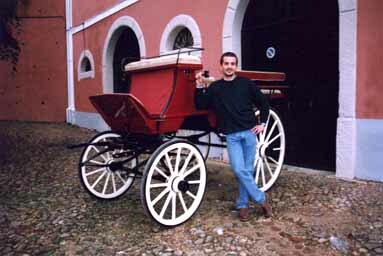 NOTE: You can use powder painting techniques with the wood if it is a modern carriage but it is considered incorrect procedure with old carriages. There are brush techniques that give as good finish as the powder ones, though they give more work. Besides.... don't forget that the brush goes deeper in the wood than the powder so the coats usually last longer. Follow the notes that you took at the beginning of your work and you'll do this quite easy. Note: At this point you're asking yourself why I never talked about the wheels.... The reason is simple.... The wheels are the exact finish of the restore work so they are left behind until then. Here are some clues on how to do a perfect and inexpensive striping: For starting you will need to make your own brushes. For that you will need to ask a friend with long and straight hair if he can give you some few of his hairs (not too many - you will need max. 10 to 12 hairs with 15 cm each). After that you must look at home for some ends of pencil (or you can slice a new pencil in 4 or 5 parts). After that you must get the pencil really sharp! Look for some glue tape and a very thin copper wire (about 50 cm should be enough). See the picture about what you need. After this you must put 2 our more hairs (depends on the width of what you want to do later) and put a small bit of glue tape just to get the hairs fixed to the pencil. Grab the copper wire and start getting it around the grabbing part of the pencil (when doing this be sure that the coppers turns are really fitting one after the other) and start going down until the point of the pencil (See picture). When you reach the point of the pencil do 2 or 3 turns and come back up to the starting point. After that put the glue tape around the pencil so that the copper wire stays in place. 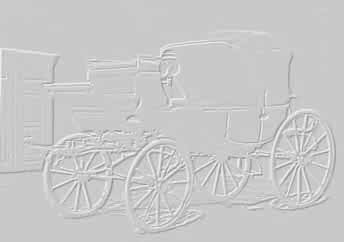 You can do several pencils with different length and width for the different situations that you will have when restoring carriages. How to become a master? That is quite easy. You must have a piece of glass with 50 cm x 50 cm to start. Pick up the brush that you have just made and pass it in the ink . Pick it up so that the point of the inked hair touches the glass that you are going to stripe. Start pulling the pencil to you and at the same time start getting it down and down until the pencil is at 2 mm of the glass and continue pulling the brush/pencil until it runs out of ink. Finished? Then pass a bit of old fabric over what you have done and do it all over again. After 1 hour or so you will be doing this as perfect as any pro! Use this tip to strip the main iron parts (use the photos that you made at the beginning) or use sketches that you've made of the original striping work. Everything will now go to its place..... Once again following that famous notes and photos that you've taken.. 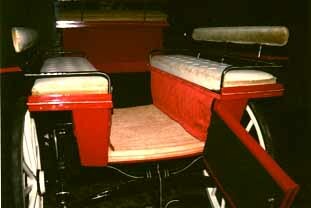 The good thing about upholstery is that is easy to do it all over again. 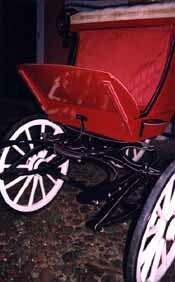 If the carriage is a excellent piece then it is better to give the fabric and upholstery works to a professional.... that way you won't risk damaging the carriage. 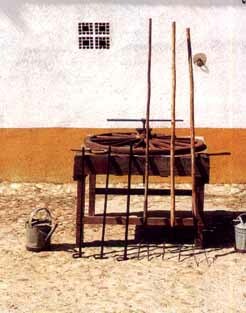 H - This must be done by four persons: with levers that have a "C" iron at the end (picture) 3 of the persons grab the iron ring and place it so that it goes 2 or 3 cm down the wood... the fourth person starts putting water over the iron so it starts contracting. 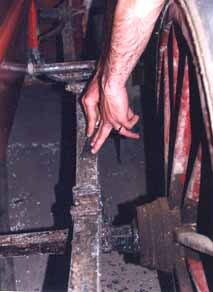 I - With the same "C" levers, the 3 persons force the entrance of the iron ring so that it burns some of the wood and gets perfectly adjusted.... the fourth person keeps on putting water over the iron ... pre process continues until the iron ring is perfectly adjusted to all the wood surface and it is cold. O - If the Hub is perfectly adjusted then you can proceed otherwise and if the problem isn't too big you can cut leather rings to adjust against the Hub base so that it gets a better vertical stability (This is a terrible English..... I am sorry). 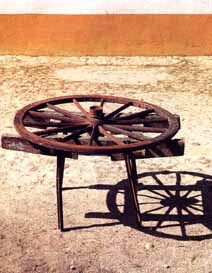 P - If the problem is too serious than you must take the axle and wheel to a professional.